Sol Calero, Casa Anacaona, commissioned by the Creative Foundation for Folkestone Triennial 2017. Image by Thierry Bal. Folkestone Triennial is the flagship project of the Creative Foundation, an independent visionary arts charity dedicated to enabling the regeneration of the seaside town of Folkestone, in Kent, through creative activity. Working with the people of Folkestone, partners and other stakeholders, the Foundation aims to transform the town, making it a better place to live, work, visit and study. Since its inception in 2008 (Andrea Schlieker was the curator), Folkestone Triennial has rapidly established itself as a significant event in the international calendar of recurring art exhibitions. It has done so by being one of a small number of contemporary art exhibitions that set out to have an effect beyond the art programme itself, changing the character of the place in which they occur. These exhibitions create a spirit of place through their collection of artworks, through changes to the physical environment and especially through changes in the thinking of the communities with which they work. In doing so, they transform a village, a town, a city, a community. 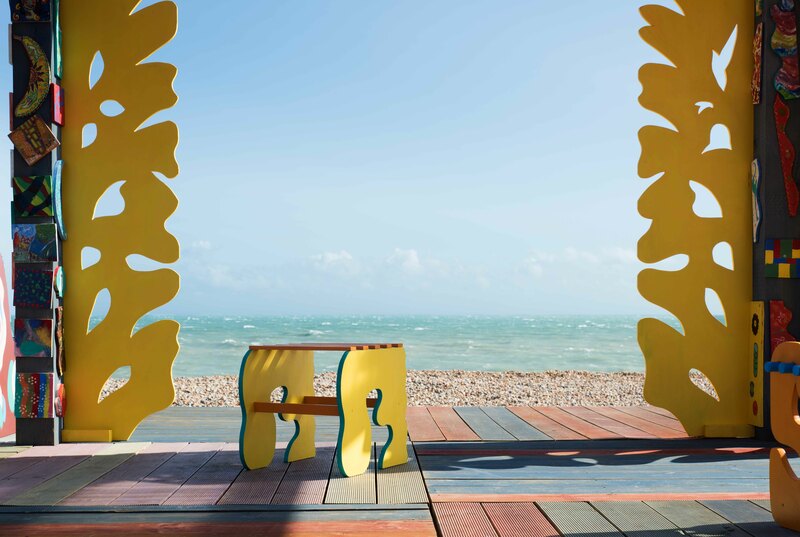 Each Folkestone Triennial invites artists to engage with the rich cultural history and built environment of the locality, and to exhibit newly commissioned work in public spaces around the town. Around twenty major artworks are commissioned for each Triennial, with eight or ten remaining in place permanently. This ambitious process is paralleled in only a handful of outstandingly creative exhibitions around the world, including Münster (Germany), Echigo-Tsumari (Japan), and Santa Fé (New Mexico). Folkestone Triennial acknowledges the inspirational example of Skulptur Projekte Münster (founded 1977) as a progenitor. Some of the artworks commissioned for Folkestone Triennial become permanent additions to the townscape. Folkestone Artworks, our “gallery without walls”, currently contains 27 works by internationally acclaimed artists such as Tracey Emin, Mark Wallinger, Pablo Bronstein, Yoko Ono, Richard Wilson, Pae White, Christian Boltanski and Spencer Finch. All works are site-specific in public spaces in the town, so the collection can be enjoyed free of charge, all year round by Folkestone residents and visitors. A further number of artworks by similarly prominent artists will join the collection from Folkestone Triennial 2017.